With thousands of applications in both the App store and Android marketplace life becomes tough when you decide to search for a new game or news application when confronted by so much dubious variety. A totally free application for both Android and the iPhone and created by Jammbox, this app has been developed to aid your search for new applications that are similar to ones you already enjoy. 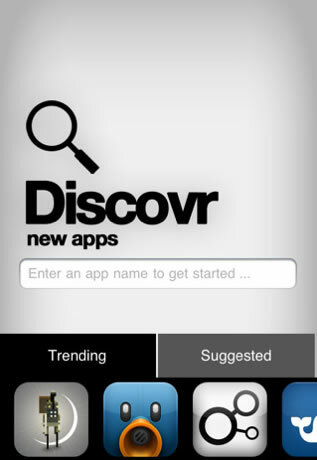 So if your into the BBC app and want a news app that might be of a similar quality and in your language, then you are easily able to “discovr” other apps that fit into your search criteria, if you want to purchase the application then simply click on the link to the app store of your choice but before that you can compare and read descriptions and screenshots of the app. The application has a novel way of providing you with six recommendations and when you click on any of these a further six based on that application so you are continually drilling down in terms of relevance and potentially of interest, a bit like stumbleupon. This app is great to beat the algorithms that seem to bring up the same old same old in both the android and apple app store, so you are sure to find some fresh new apps of interest and check out what they look like and sound like before you take the plunge to purchase. The popularity of the application has meant that it has been number 1 in terms of downloads in 17 countries including Germany, so why not give it a try, at a cost of absolutely nothing you have very little to lose!